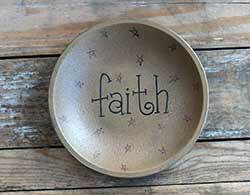 Primitive plates and trays featuring scripture or faith based messages! 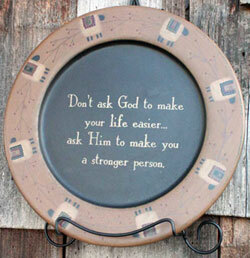 A Stronger Person Plate, by Barbara Lloyd for The Hearthside Collection. This primitive plate has a black background and mustard rim, decorated with folk art sheep and vines. Reads: "Don't ask God to make your life easier...ask Him to make you a stronger person." Measures 11.25 inches in diameter. Decorative use only. One of our longest-standing and best-selling Hearthside items, this rustic wooden tray features delicate painted bittersweet vine and primitive stars. 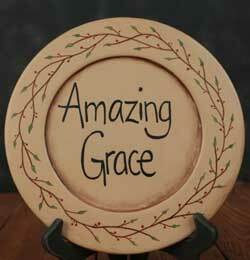 Reads: Amazing Grace. 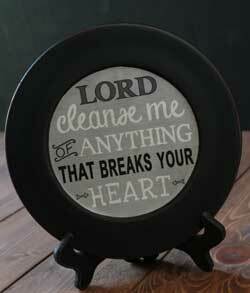 Cleanse Me Plate, by The Hearthside Collection. Rim is painted and distressed in black, with distressed lettering printed and decoupaged to the center in shades of grey, black, and ivory. Reads: lorde cleanse me of anything that breaks your heart. A Barbara Lloyd design. Measures 9.5 inches in diameter. Made of hand-painted pressed-wood, distressed and aged for a rustic look. Decorative use only (don't use with food). Plate stand also available (sold separately). Do Everything in Love Plate, by The Hearthside Collection. Rim is painted and distressed in black, with distressed lettering printed and decoupaged to the center in shades of grey, black, and ivory. 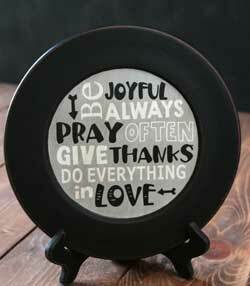 Reads: Be joyful always, pray often, give thanks, do everything in love. A Barbara Lloyd design. Measures 9.5 inches in diameter. Made of hand-painted pressed-wood, distressed and aged for a rustic look. Decorative use only (don't use with food). Plate stand also available (sold separately). Down to Nothing Plate, a Barbara Lloyd design for The Hearthside Collection. Painted and distressed in burgundy red; lettering is printed on vintage-style decorative paper and sealed to the center of the plate. 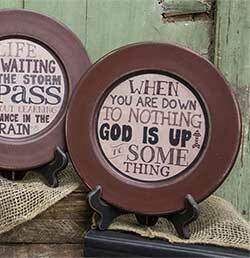 Reads: When you are down to nothing, God is up to something. Measures 9.5 inches in diameter. Made of pressed wood, intentionally distressed for a rustic look. Decorative use only (do not use with food). Plate stands also available! 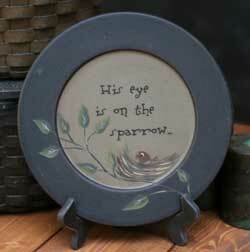 Eye is on the Sparrow Plate, by The Hearthside Collection. A Donna White design. Measures 9.75 inches. Made of hand-painted pressed wood, antiqued and distressed for an aged, rustic look. Decorative use only (not food safe). Plate stand also available (sold separately). 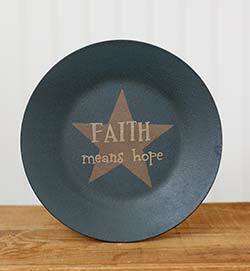 Faith Distressed Plates, a Barbara Lloyd design for The Hearthside Collection. Set of three inspirational plates, painted and distressed in black with vintage newsprint. These says Faith, Family, and Friends. Measures 6 inches each. Pairs well alone in a plate stand or all together in a plate rack (sold separately). As with all Hearthside plates, these are rustic and distressed, adding to the individual charm. This primitive wooden shallow bowl features folk style stars against a mustard/tan background. Center reads "faith." God Distressed Plates, a Barbara Lloyd design for The Hearthside Collection. 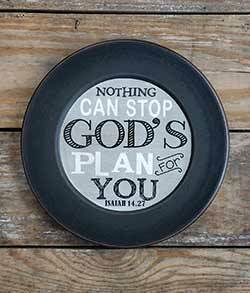 Set of three inspirational plates, painted and distressed in black. Lettering is printed on decorative paper with an aged look, and sealed to the center of the plate. Measures 8.5 inches each. Pairs well alone in a plate stand or all together in a plate rack (sold separately). As with all Hearthside plates, these are distressed for a rustic look, adding to the individual charm. Decorative use only (do not use with food). God's Hand Square Plate, by The Hearthside Collection. Reads "God has his hand on your back." Features a black and tan color scheme - the border has a newsprint like pattern. Measures 10 inches. Made of hand-painted pressed wood, antiqued and distressed for an aged, rustic look. Decorative use only (not food safe). Plate stand also available (sold separately). Reads: Nothing can stop God's plan for you. A Barbara Lloyd design. 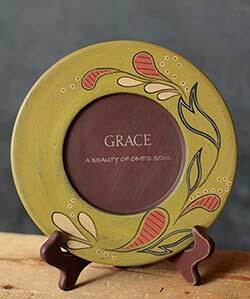 Grace Plate, by The Hearthside Collection. Features a burgundy background and lime green rim with paisley design. Read: "Grace, a beauty of one's soul." Measures approx 8.5 inches. 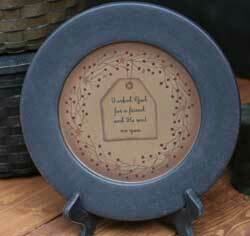 I Asked God For A Friend Plate with Tag, by The Hearthside Collection. This primitive plate features a black rim and tan background, with painted tag and berry fine. Tag reads: "I asked God for a friend and he gave me you." Made of painted, pressed wood, purposefully antiqued and distressed for an imperfect, aged and rustic look. Decorative use only (not food safe). Plate stands also available (sold separately). Lead Me to the Rock Plate, a Barbara Lloyd design for The Hearthside Collection. Painted and distressed in black; lettering is printed on decorative paper in a black, white, and grey color palette and sealed to the center of the plate. 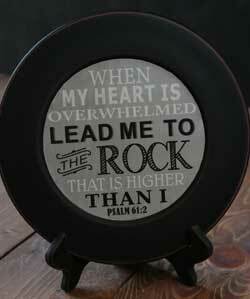 Reads: When my heart is overwhelmed, lead me to the rock that is higher than I (Psalms 61:1). Measures 9.5 inches in diameter. Made of pressed wood, intentionally distressed for a rustic look. Decorative use only (do not use with food). Plate stands also available! Lead Me to the Rock Plates, by The Hearthside Collection. Set of three inspirational plates, painted and distressed a black, grey, and white color palette with whimsical lettering. Measures 9.5 inches in diameter. Pairs well alone in a plate stand or all together in a plate rack (sold separately). As with all Hearthside plates, these are rustic and distressed, adding to the individual charm. Let the Morning Plate, by The Hearthside Collection. 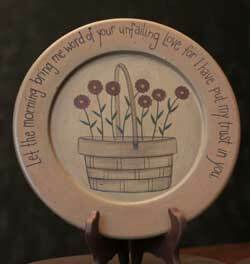 This primitive plate features a tan background and hand-painted red flowers in a basket, and it reads: "Let the morning bring me word of your unfailing love for I have put my trust in you." Measures approx 11.25 inches. Made of hand-painted pressed wood, antiqued and distressed for an aged, rustic look. Decorative use only (not food safe). Plate stands also available (sold separately). 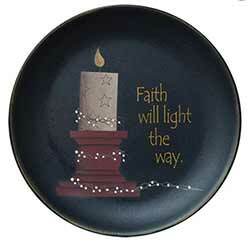 Light the Way Plate, a Michelle Kildow design for The Hearthside Collection. Reads: "Faith will light the way." Features a painted candle against a black background. Little House Plate, by The Hearthside Collection. 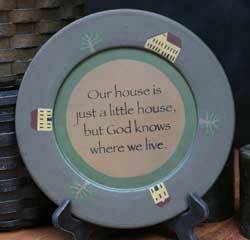 Reads "Our house is just a little house, but God knows where we live." Measures approx 9 inches. Made of hand-painted pressed wood, antiqued and distressed for an aged, rustic look. Decorative use only (not food safe). Plate stand also available (sold separately). 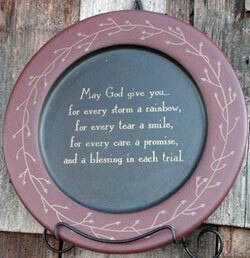 May God Give You Plate, by Barbara Lloyd for The Hearthside Collection. This primitive plate has a black background and burgundy rim, with decorative vines. Reads: "May God give you...for every storm a rainbow, for every tear a smile, for every care a promise, and a blessing in each trial." Measures 11.25 inches in diameter. Decorative use only. This plate is painted in a palette of black, red, and tan. 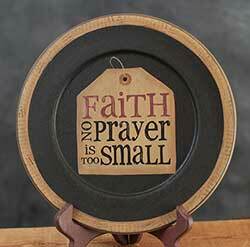 Reads: "Faith: no prayer is too small." 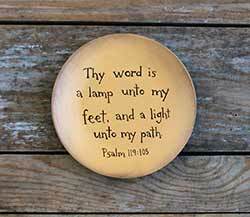 Scripture Distressed Tray, a Barbara Lloyd design for The Hearthside Collection. Tray painted and distressed in black with vintage lettering. Sold individually from the three trays shown - Choose the Left, Middle, or Right Tray. Left reads: Many are the plans in a person's heart, but it is the Lord's purpose that prevails (Proverbs 19:21). Middle/upper tray reads: But as for me I will always have hope (Psalm 71:14). 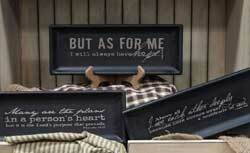 Right tray reads: Above all, love each other deeply, because love covers over a multitude of sins (1 Peter 4:8). Measures 13 x 5 inches. Pairs well alone in a plate stands (sold separately). As with all Hearthside plates, these are rustic and distressed, adding to the individual charm. Strength Plate, by The Hearthside Collection. A Sabrina Wingren design. 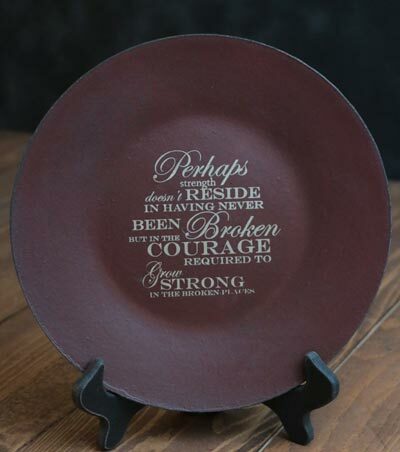 Burgundy plate reads: "Perhaps strength doesn't reside in never having been broken but in the courage required to grow strong in the broken places." Measures 9.75 inches. Made of hand-painted pressed wood, antiqued and distressed for an aged, rustic look. Decorative use only (not food safe). 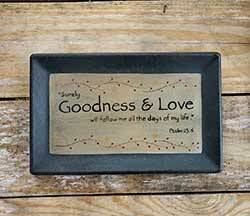 Surely Goodness & Love Primitive Tray, by The Hearthside Collection. 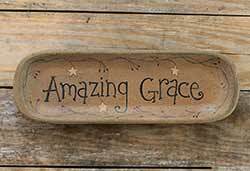 This primitive wooden tray makes a great inspirational gift or shelf decor! 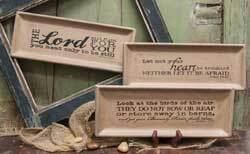 Vintage Scripture Distressed Tray, a Barbara Lloyd design for The Hearthside Collection. Painted and distressed in taupe with black lettering. Sold individually from the three shown. Lord plate reads: "The Lord will fight for you, you need only be still (Exodus 14:14)." Heart tray reads: "Let not your heart be troubled, neither let it be afraid (John 14:27)." Bird tray reads: "Look at the birds of the air, they do not sow or reap or store away in barns, and yet your heavenly father feeds them (Matthew 6:26)." Measures 13 x 5 inches. Plate stands (sold separately). As with all Hearthside plates, this is rustic and distressed, adding to the individual charm. When times are Tough Plate, by The Hearthside Collection. A Barbara Lloyd Design. Features a color palette of burgundy, black, and mustard, with painted polka dots. 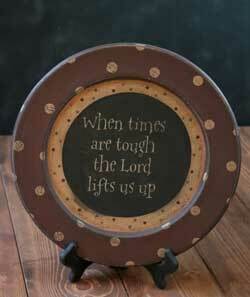 Reads: "When times are tough, God lifts us up." Measures 13 inches. Made of hand-painted pressed wood, distressed and aged for a rustic look. Decorative use only (not food safe). Plate stands also available (sold separately).